Iceland, the UK supermarket chain, is the most recent brand to take a more sustainable turn by announcing that they will phase out palm oil in their own brand products by the end of the year, in favour of more environmentally friendly alternatives. This kind of move is a recent business trend that not only supports great causes and makes steps towards change, but also benefits brands in their marketing and PR efforts too, with the added plus of settling their consciences. The move comes amongst a wider movement away from traditional advertising methods, that being the likes of radio adverts or billboards, in favour of a new more communicative and personalised style of advertising that fits in more with our daily lives, as opposed to disrupting it (like those annoying TV ads that make you wait another 4 minutes to hear the winner of the Great British Bake Off). The new normal of the mass media and the constant daily stream of information that we are presented with has created new habits, where we have to be filtering these inputs all of the time. This means that we now are used to questioning the motives behind information, including that presented to us by businesses, which leads us to factor in our impressions of a company’s authenticity during our buying decisions. Pair this change with with a more technologically advanced society that has more time to care more about societal issues than ever before, and so results a new world of doing good whilst doing business. Millennials have fuelled this move, with 9 in 10 saying that they would choose one brand over another if the other was associated to a cause, according to a 2015 Cone Communications CSR study. It even filters down into how they are looking for work, where one study found that 92.1% of millennials believe that working for a responsible company is so important that it has become one of the criteria considered when applying for the right job. So being a part of this movement is becoming ever more important for brands in their products and customer-facing environments and also in their internal operations, this arguably makes it a necessary change for all corporations in the future. Let’s take a look at some of the ways brands have been really effectively implementing a socially responsible strategy. 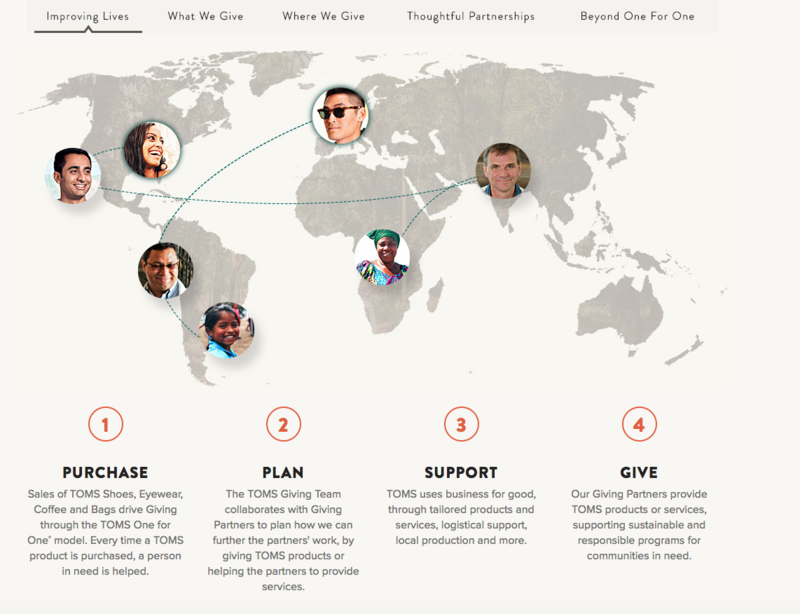 Toms has made the move to make giving back one of the biggest parts of their business, it’s become a part of who they are and they focus on this as much as they do their products. The One For One initiative helps a person in need by providing shoes, sight, water or safer birth with every product purchased. On their website, this even takes centre stage, with the only two drop-down menus being towards the ‘Shop’ part to their website or the ‘How We Give’ part, strongly encouraging website visitors to find out how they work on their promise and why they do it. Their business model is highly focused on their One for One promise and they have built themselves a great reputation as being an ethical and socially responsible brand through it. Listed in Forbes as having the best CSR reputation of 2017, Lego has been making big steps towards sustainability. 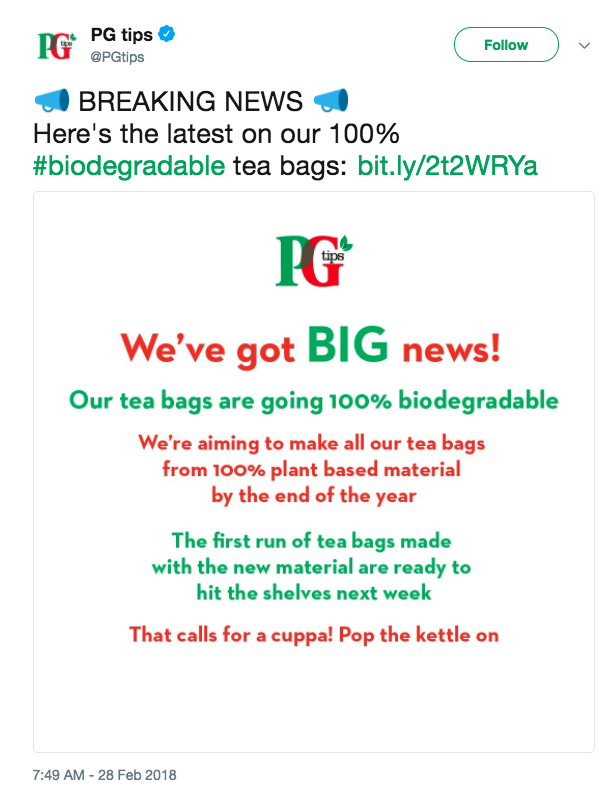 They’ve announced that 2018 will see the introduction of plant-based plastic sourced from sugarcane to make up their botanical elements such as leaves, bushes and trees. Tim Brooks, the VP of Environmental Responsibility at the LEGO Group noted that “this is a great first step in our ambitious commitment of making all LEGO bricks using sustainable materials”. Not only this, but they also have a partnership with the World Wildlife Fund for Nature (WWF), to reduce CO2 emissions in manufacturing and supply chain operations, and promote global action on climate change. They have also invested heavily in wind power, so the energy used to make LEGO bricks is balanced by the production of renewable energy. Another aim of theirs is towards zero waste in operations by 2030. The Dutch company is paving the way for a more sustainable approach to business and you can only praise them for that. 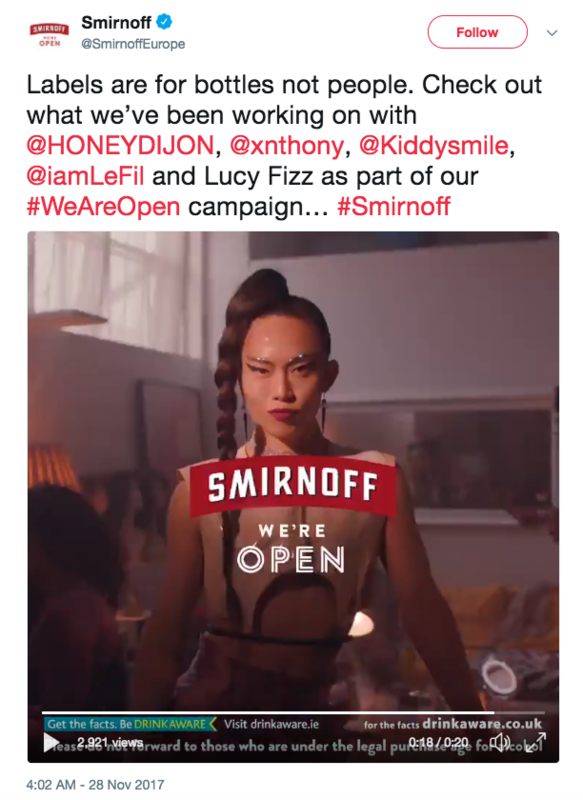 Smirnoff has been a leader in CSR which supports the LGBTQ+ movement for some time now. Their most recent campaign stars DJ Honey Dijon, French LGBTQ+ icon Kiddy Smile, British transgender model Lucy Fizz and performance artist Xnthony. In this film, Smirnoff really embraces the idea that nightlife is for everyone and it’s a place where people have been able to be their true selves historically, the focus is on the idea that labels are what we used as a society to separate groups of people by who they are, and they stand against that. 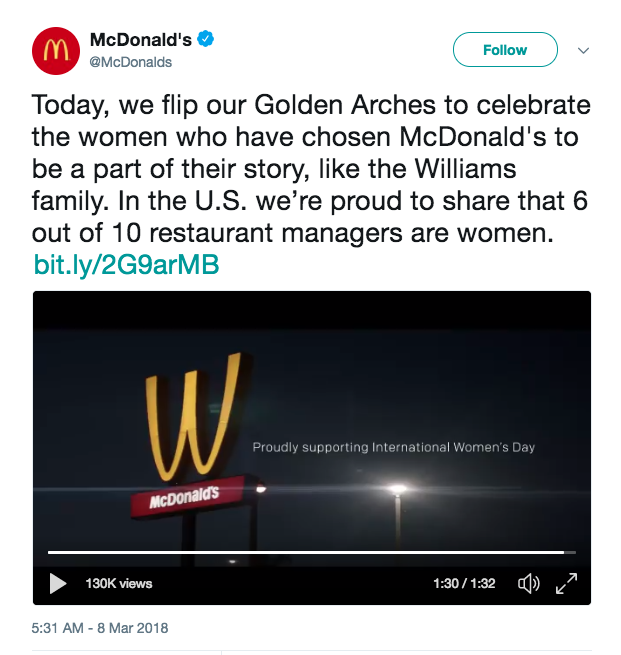 Considering their controversial past around workers’ pay, family leave and even sexual harassment allegations, Mcdonalds should have been smarter here. 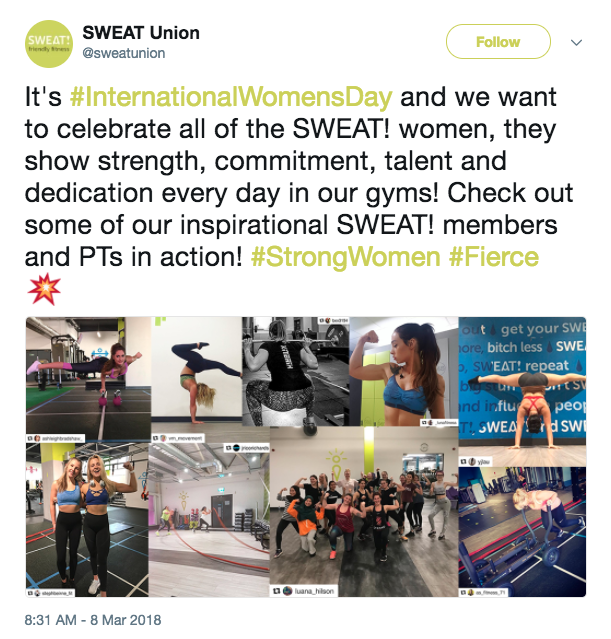 Their ‘contribution’ to the international day for supporting and raising awareness of women’s rights and equality was to flip their social media ‘M’ upside down to be a ‘W’ which hardly makes up for any of their past failings nor does it do much to help the movement other than reminding us that women exist. The media and the public alike picked up on this and they faced some pretty hefty backlash because of it. 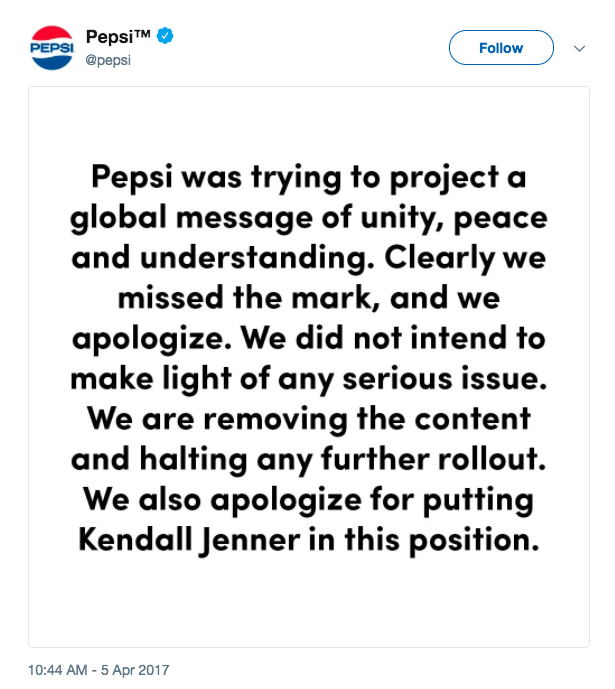 One of the biggest controversies of the past couple of years in the advertising world was that of the Kendall Jenner Pepsi ad, the ad featured the supermodel joining a protest, which in reality are often tense standoffs with police, but in this case she walks in with a can of Pepsi, saves the day and the protest erupts into cheers and smiles. This ad not only trivialised the Black Lives Matter movement and protests which were happening at the time but it also glamorised the act of protesting, represented it as a trend, and even managed to place a white woman and her can of Pepsi in the middle as the ‘saving grace’ of the situation which didn’t resonate well with the public. In a statement, the company said that “Pepsi was trying to project a global message of unity, peace and understanding” but they well and truly missed the mark on this one. An attempt at irony backfired in this campaign. 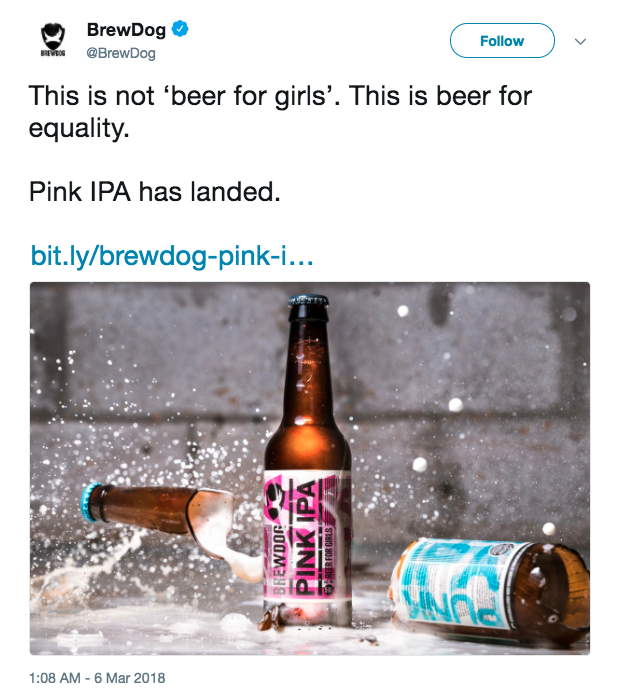 Brewdog’s contribution to International Women’s Day this year was a badly thought-out target on stereotypes, they released a limited edition pink beer bottle which said ‘beer for girls’ on the label, this went with a social media post: “This is not ‘beer for girls’. This is beer for equality.” Whilst their heart was in it, they executed it very poorly and some would even say it was an incredibly lazy mistake. It wasn’t enough to clarify on a social media post the reasoning for creating a stereotype-infused product. They released a statement saying that "BrewDog will be using its most iconic beer, Punk IPA, as a weapon in this fight, packaging it in lurid pink and renaming to Pink IPA – a send-up of the lazy marketing efforts targeting the female market". So they pretty much did exactly what they were trying to condemn. Good luck next time Brewdog. So, what have we learnt? Well, the soulless money making machines of the past are slowly but surely being replaced with socially responsible businesses. These are companies that want to effect change and they do so by integrating it into the very core of their values. They find their very own path towards better practice and social change, and you should too. Check out our blogs here for more insights into business, marketing and technology.